Jules Sagot wears navy blue high top Converse “Chuck Taylor” All Stars in the film. Aurélio Cohen wears optical white high top Converse “Chuck Taylor” All Stars in the film. Théo awaits the announcement of whether he was accepted into the acting academy. Twenty-year-old Théo (Jules Sagot) is at a turning point in his life. As the film opens he, along with his girlfriend Jeanne (Clara Bonnet) and other Parisian drama students, are waiting for the acceptance notices to be posted online from a prestigious acting academy in Lyon where they have applied for admission. Théo’s body language tells it all. He appears bored and aloof, like he already knows that he won’t be accepted. (He wasn’t). However Jeanne and several of the others were accepted and are now excited about their futures while Théo now needs to find work to support himself. Luckily an opportunity has presented itself. A wealthy family needs a babysitter to watch over their ten-year-old son, Léo (Aurélio Cohen), who we first meet in another prologue to the film. Léo is bright and talented, reciting a long poem he has written himself to his father (Grégoire Monsaingeon), who acts unimpressed with his son’s efforts and doesn’t give him any praise or encouragement. When Théo goes to interview with Léo’s father, he is told that Léo is not like other boys, preferring to read and draw rather than be sociable or participate in sports. His father wants to be hands-on with the upbringing of his son and has demands about his upbringing, but his business requires his time during the hours from 4:30 to 9 during the week when Léo is done with school. He originally hired a girl for the job but she backed out. When Théo asks to meet Léo, the boy is very rude, refusing to even say hello and talking in an affected accent. Clearly they have issues, but Théo needs the money so he accepts the job. Léo’s parents have very different ideas about how to raise him. Théo starts his job the next day, but Léo is standoffish and uncooperative, refusing even to speak to Théo or respond to his suggestions for things they could do together. It seems that Léo is very much a loner, with no friends at school, and confined to his home the rest of the time. Théo is finally able to break through Léo’s wall of silence by leveling with him and telling him that he needs this job or he will be out on the streets. “You can't be left by yourself so here’s the deal,” he tells Léo. “I leave you alone and you play along. Truce? How about some soccer?” Léo then responds that he had an accident at age five and now he can’t run. Théo next deals with Léo’s use of a phony accent by telling Léo that he likes accents and it doesn't bother him if Léo wants to use one. Suddenly Léo wants to go to bed, but the breakthrough has been made. The next day Theo discovers another surprise: Léo's mother Catherine (Eléonore Pourriat) who has isolated herself in a top floor bedroom. Later Théo talks Léo into a nice gesture of bringing her tea on a tray. Eventually Léo reveals her story: after his accident she was at the hospital day and night. When he was able to come home again, she couldn't deal with being a 24/7 mom anymore, and withdrew from her family and the world. Over the next week, Catherine starts to come out of her shell and takes an interest in Théo and Léo, watching with approval as their friendship develops. Théo acts like an older brother, encouraging Léo to become more active by playing soccer, and more outgoing about his interests which include a talent for playing the guitar. Théo also is interested in playing the guitar and soon the two are jamming songs together. The two become close friends. At first Léo kept his distance from Théo. Their burgeoning friendship, which is a delight to Catherine, now becomes an issue for the father. He begins to feel that he is being replaced as a role model for his son by Théo even though he doesn’t really want to spend actual time with Léo or respect his artistic interests. He becomes jealous that Théo communicates much more easily with Léo and Catherine and now has Léo doing fun things like playing ball and singing songs. Things come to a head when Catherine invites Théo over to their home on the weekend for lunch, proposes that he live there on a full time basis, and asks the boys to perform one of their songs. The two decide to make a big deal of it, go upstairs, put on makeup, dress like native island women, and start to perform the song in drag. Catherine thinks it is hilarious but the father freaks out. After a heated discussion in which he tells Théo that this is not what he wants for his son and furthermore that he has met with his girlfriend Jeanne and talked about Théo’s failures, he then tells Théo to leave and never come back. This leads to a final breakup between Théo and Jeanne, and Théo going on a drunken rampage. 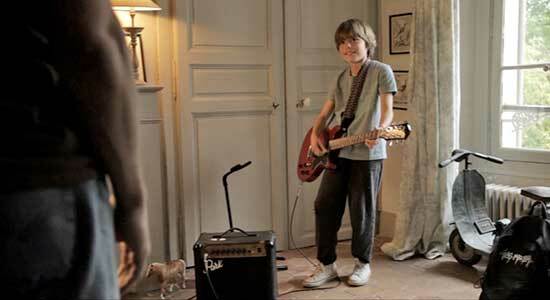 Meanwhile, back at Léo’s house, his father and mother must go away the next weekend to a wedding, and the father asks Jeanne to watch Léo. This turns out to be a bad idea, as Jeanne uses it as an excuse to invite her friends over for an extended party, ignoring Léo while they revel in the house and grounds. That evening Théo comes back to visit Léo, and when Jeanne finds him there, she tells him to leave. He refuses, saying that he will call Léo’s parents if she doesn't let him stay. Later after more arguing between Theo and the other students, Théo decides to take Léo on a road trip to the ocean to get away from it all and revive their friendship. How all this resolves after the parents return and find their house trashed and son missing makes up the balance of the story. Léo shows off his abilities as a rock guitarist. You’ll Be a Man is a family affair in its production. Writer and director Benoît Cohen cast his son Aurélio in the role of Léo, and the boy puts in an excellent performance. You feel an emotional connection to this young preadolescent kid, who for the first time is able to have a real friendship beyond the confines of his cloistered family life. Likewise, Jules Sagot is well cast as the twenty-year old student on the cusp of adulthood, but still a boy at heart. He's not the brightest, or most accomplished person around, but he conveys a sense of genuine emotion in the way his character reaches out to Leo and his family. The film makes you realize that there can be a lot of pleasure in just the simple elements of family life, and it seems the point of the story line is that sometimes it takes an outsider to make you realize that. Despite the age differences between the characters, they all end up learning something about what truly is important in life from each other. This is a delightful French film, with its other main characters well cast, Eléonore Pourriat as the dropout mother who learns to find her footing again, and Grégoire Monsaingeon as the controlling father who learns that a happy family is made of individuals who are recognized for their self worth. This film is in French with English subtitles. Théo and Léo work things out at the beach. Théo pulls off his left chuck in anger. Jules Sagot who plays Théo, wears well-worn navy blue high top chucks throughout the film. Along with his rumpled tee shirts and faded jeans, chucks are the perfect sneakers for a struggling college student. Léo (Aurélio Cohen) wears optical white high top chucks in most of his scenes, a popular fashion choice for a twelve-year-old kid. The camera work is chucks friendly in this film, with many fully framed shots of Léo and Théo. The best chucks scene is when Théo is waiting to hear from Jeanne, but she has not been responding to his calls. It is now becoming clear that she is starting to break up with him. Seated on a landing in Théo’s home, he checks his phone for messages but there aren’t any. Frustrated and angry, Théo pulls off his left chuck and throws it on the floor. There is a long shot of him sulking with his shoe in the foreground. The camera shows his shoe after Théo throws it down in anger. You’ll Be A Man. (2013) Jules Sagot, Aurélio Cohen, Eléonore Pourriat, Grégoire Monsaingeon, Clara Bonnet. Written and directed by Benoît Cohen.